Collaboration is key. January is a great time to introduce monthly family meetings. These are most successful when not used to come down on your children for what they’re not doing well enough. Rather, they’re an opportunity to address problem areas that need resolution. So, instead of saying something like “I’d like you to get off your phone so that you can help me more” say something like “I feel like I’m the last person standing in the kitchen after dinner. I’d like to explore a solution to this so that I don’t feel so alone.” When presented in this way, your children will often come up with creative solutions – many that you may not have thought of. The idea is not to impose unilateral rules on the kids but to have them problem solve with you. It doesn’t mean that they are calling the shots. It means that their voices are being heard, that they are encouraged to speak up and they are more inclined to follow what’s been decided on when they’ve played a role in planning for it. Don’t fan the flames. If, for example, you’ve recently had an argument with your child about whether or not he can stay out past midnight, try not to have this argument cloud other conversations. After feelings have been validated and you’ve put the argument to rest, put it behind you. Create opportunities to come together as a family with as few distractions as possible. Sometimes going outside of the house is best, especially if you have a long list of to dos inside. Board game cafes, bowling, ice skating, throwing a ball or frisbee in the park are some ways to connect. Often, as kids get older. they will decline your invitation but if you let them know how much it means to be spending time with them, and if you make the outings as positive as possible, they will likely get into the right frame of mind once they are engaged in the activity with you. Help them see their parents in a positive light. 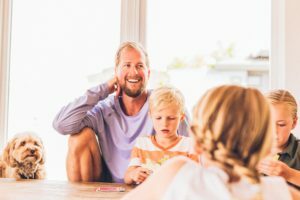 Whether living together or apart, the way we treat our children’s other parent, and the things we say to or about him or her, sets the tone for how our children will treat and view them too. Even if you’re angry or upset at one another, try not to expose your children to this- no matter their age.